A typical structure is formed on Voltas today. The stock has closed above its earlier top. The earlier top is marked with a black arrow on chart. This hints us at a change in trend from current down trend to an uptrend for short term. Increase in volumes hinting at an increased buying in this stock. Entry in the stock to be managed properly as a small pullback can not be denied from current levels. The upcoming resistance areas are marked with red line on chart. Deep Industries caters to the services required by Oil and Gas companies like ONGC and Reliance. Friday's chart shows a fresh breakout in Deep Industries. This breakout has come with large volumes. The stock is ready for next move. 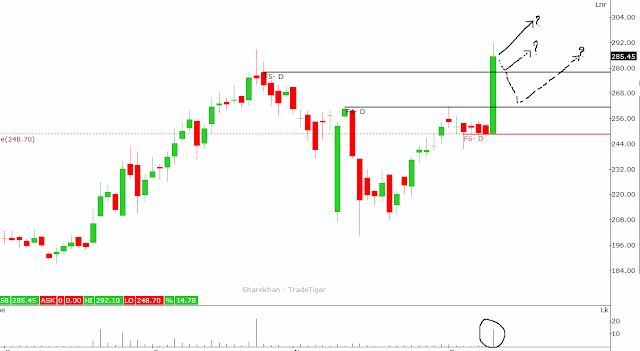 Breakouts are followed by consolidations. We do not know whether to stock will continue the movement or it will pause for a consolidation. I have marked the support areas on chart below. Entry levels can be tricky. When trading breakouts, the Risk Management becomes more important. However this pattern can give some quick gains. To begin with (for those who are new), lets spend some time in understanding as to what is a 'Success Ratio" in trading. Success ratio is nothing but the number of winning trades out of the total trades taken. For example - If a trader takes total 10 trades, books profit in 7 trades and book loss in 3 trades, his Success Ratio is 70%. As he has 7 winners out of 10. Suppose a trader takes 100 trades in one year. He books profit in 65 trades and books losses in 35 trades. Then his success ratio is 65%. Now since we know, what the success ratio is, lets move on to understand why am I saying that you don't need 90% success ratio. Let me put this statement this way- you don't necessarily need beyond 65% success ratio to make money in markets. However, on the contrary, most traders / investors in stock markets are obsessed with high success ratio. They feel Analysts and Researchers have methods to precisely predict the stock movement. This is why many advisers and tip providers try to take an advantage out of this situation. Most of them claim that they have more than 90% success ratio. I am not saying that the research is not required. However, giving undue importance to research and ignoring some other important aspects of trading can be a blunder. You have to finally break your belief and trust that Risk Management and Money Management are the most important aspects of making money in trading. If I have to weight Research against Money and Risk Management in trading- I would give weight of 60 out of 100 to Risk and Money Management. I would give a weight of only 40 out of 100 to research. Stock A recommended to be bought at Rs 150 which has a stoploss of 140 and a target of 180. So the Risk Reward Ratio in case of Stock A is RR Ratio= Risk/Ratio= 10/30 or 1:3. This means that trading in stock A has risk of Rs 1 for Reward of every Rs 3. Here is Why I am saying that you don't need 90% success ratio to make profits in market. Say, a trader takes 10 trades during a specific period of one month. Here are 3 different scenario with different Winning Ratio and same Risk Reward Ratio. Lets assume all the trades have RR Ratio of 1:3. It means each trade profit's Rs 3 in each winning trade and looses Rs 1 in losing trade. Lets assume all the trades have RR Ratio of 1:3. It means each trade profit's Rs 3 in each winning trade and loses Rs 1 in losing trade. It means you can make profits even if you have 50% profitable trades. This means the Winning Ratio is just 30% and trader is losing out on 70% of the trades. Wow that's the news. Even a poor fellow with 30% winning trades (Success Ratio) is making profit. You don't need 90% winning trades to make profits in market. You need proper Risk Management along with proper Money Management. In my Trading Advisory Application the focus is on Risk and Money Management. Trading Advisory Application is an online tool built by us to reach our subscribers with detailed reasoning of and analysis of a trade. Here you will find that every recommendation is coupled with an analysis and reasoning. 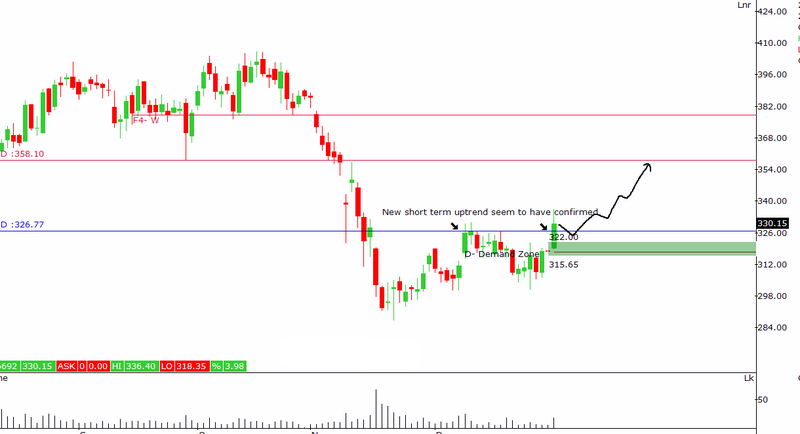 The trading style is – Positional with delivery in cash segment. Objective is to make 30% to 50% profit during the year.